It seems unbelievable that it has been almost a year since writing about Bart’s last fun day. 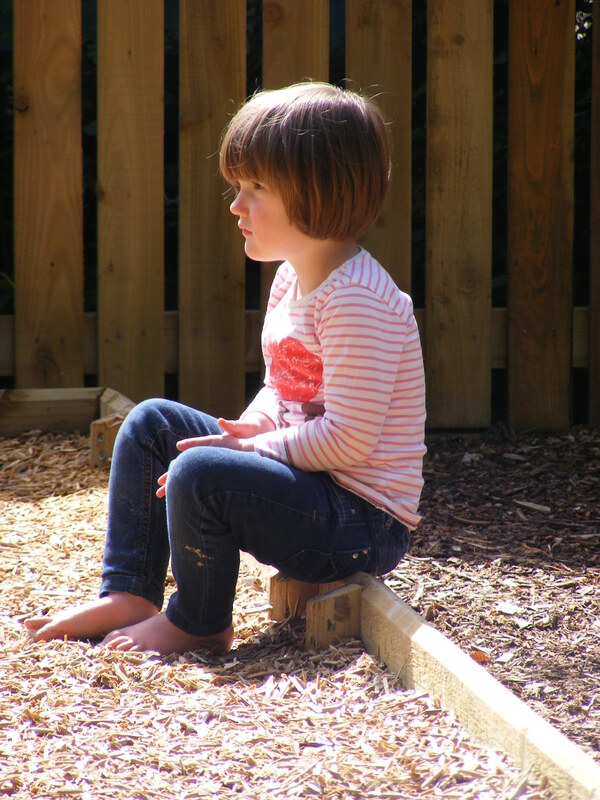 Time has sped by so quickly and we are swiftly coming to the end of her time in playgroup. 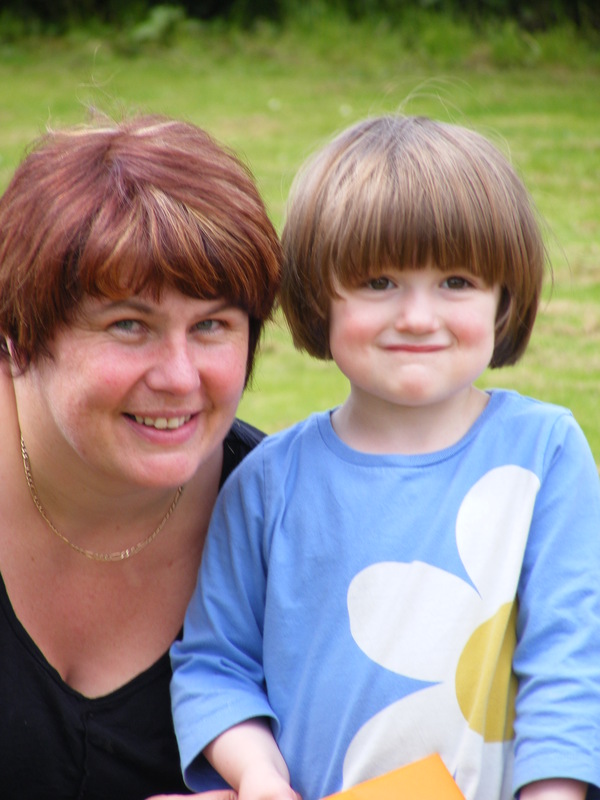 My wee toot who was in nappies and couldn’t walk without holding on when we brought her home, will be going to school after the summer holidays. The sky was overcast today and there was a little rain shower in the middle of the morning, but the kids again had a great time. 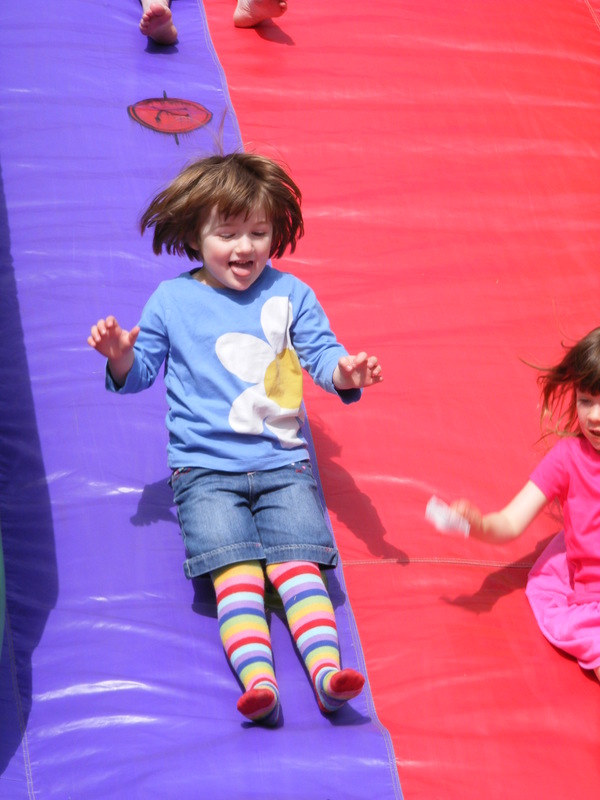 The bouncy castle was a huge hit, along with the bicycles and balls to play with. 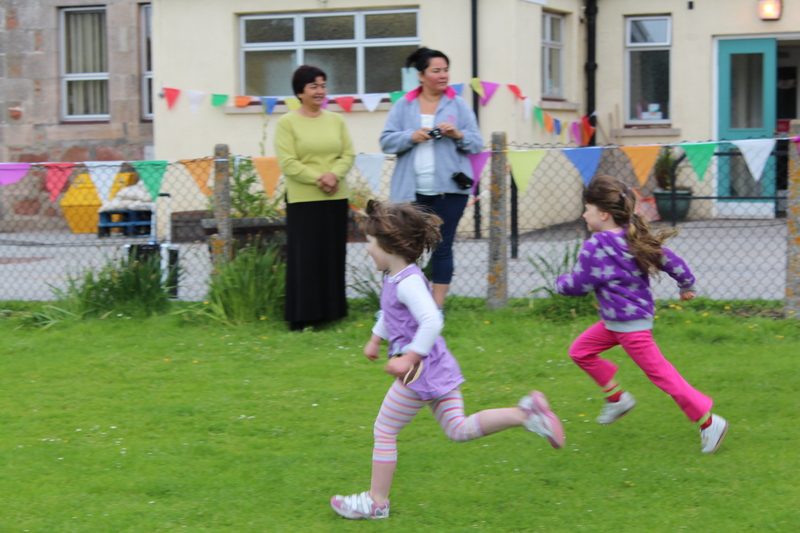 The children had a mini sports day and Bart came first in the running race. 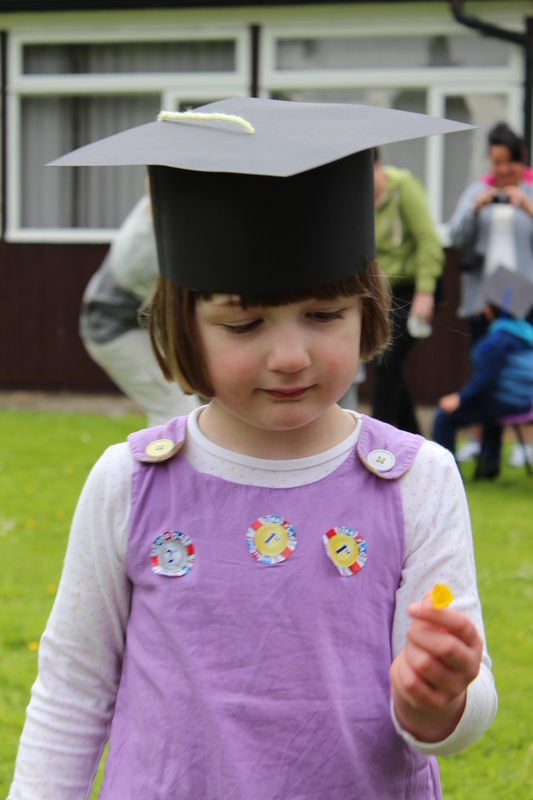 After play was finished and the castle deflated, the children who are heading onto “big school” this year, put on hats they had made themselves to have their graduation ceremony. It is amazing to think how fast these last three years have flown. I remember going into the playgroup to register AJ, and the filling out of paper work made the fact we were getting these two little girls seem so much more real. It seems strange now that as I was writing AJ’s name on the forms, I had no idea what my daughters even looked like. Those early months were sometimes a blur and I think Nicola and Viv, the playgroup leaders, must have noticed the dazed, shell-shocked look in my eyes. They were always supportive and sometimes just a kind encouraging word from either of them helped me through another day. 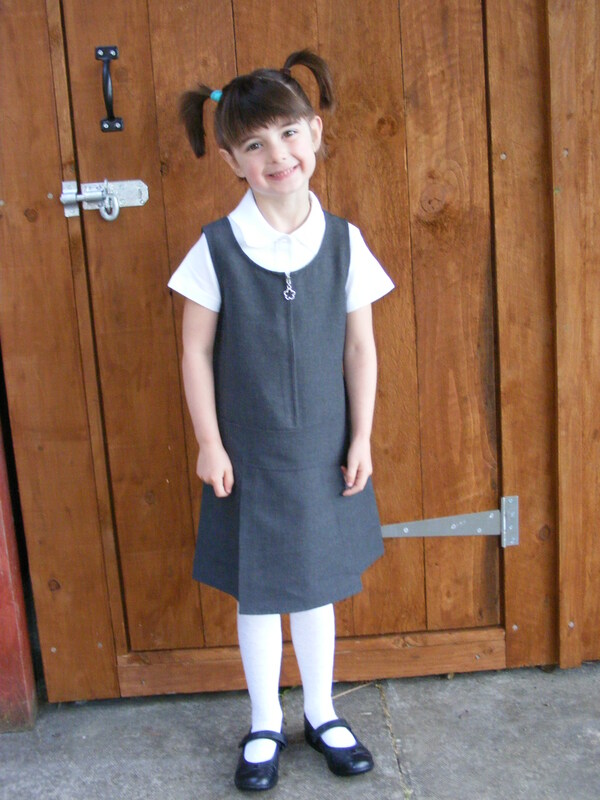 Now AJ will be heading into her third year at primary school and Bart will be going into primary one. There is only a week to go before summer holidays start and another chapter of my life begins. Both of my little ones will be school girls. When people ask what will I do with both children in school, I joke and say ‘party for the first week’ but now that it is nearly here, I am not sure if I am ready. I knew this week was going to be a bit crazy with the normal school and playgroup runs, swimming lessons and working two jobs. But on top of that I’ve also had to go to the nearest town (which is 17 miles away) and buy AJ new trainers as hers had fallen apart (her feet were hanging out of them), a primary one induction garden party, Bart’s playgroup trip, AJ’s sports night and a trip to the dentist to have a crown fitted. I also managed a coffee morning with pals, lunch with my Mother-in-law and heading to meet another friend, while picking up hay for the guinea pigs. Yesterday afternoon I did catch a five-minute snooze between getting back from the playgroup trip and collecting AJ from the school bus. I put my head on the kitchen table and was shooting up z’s in seconds. This evening Jay and I high-fived as he got in from work and I left for my job. When I pulled up in the village where I work and got out of the car, I spotted a pair of ears in the back. There sat Willow, our old collie dog. She had been asleep in the boot of the Landrover and only woken up when I turned the engine off. I called Jay, who had the girls in the bath, and made arrangement for him to come into town with the kids in their pj’s and pick her up. I got into work, put my coat away, clocked in and headed to reception to find out what tables had been booked for that evening. Only to discover I had the wrong bloody night! Yep, I am supposed to be working Friday and Saturday not Thursday! I clocked back out again, grabbed my coat and bag, called Jay to say not to bother coming to get Willow and headed home. I have now sent Jay out to get fish and chips. Damned if I am cooking! 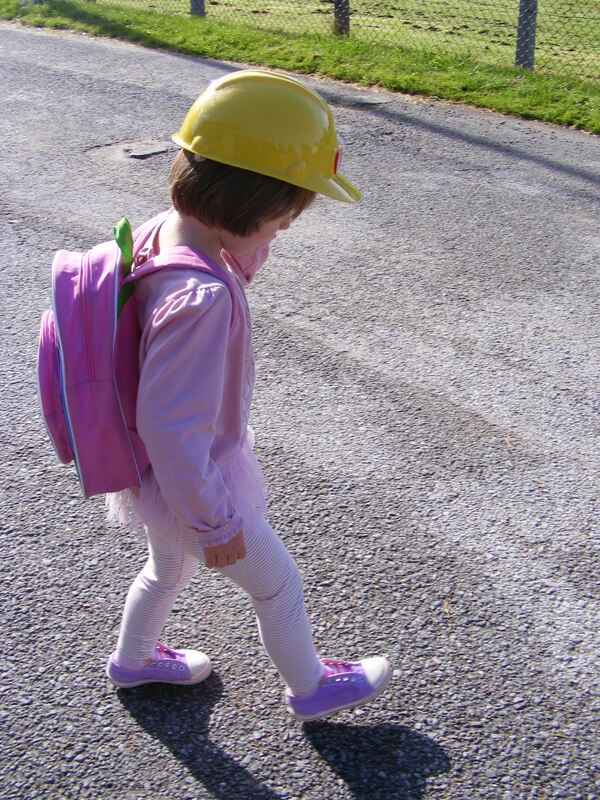 AJ’s school classroom is next door to where Bart currently goes to playgroup, so I sometimes see my older daughter running about her business or heading to the gym to do games. Today I was talking to one of the mums while waiting to collect Bart when I heard a little voice call “Hello Mum,” I looked up to see AJ running along the short hallway. “Hi” I called back as she disappeared in a streak of grey skirt, black spotty tights, burgundy sweater and shiny pink shoes. Huh? My daughters classroom shoes are black pumps from Clarks. 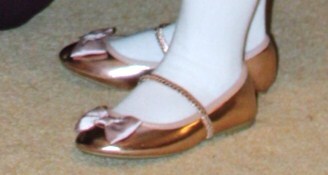 Not metallic pink, ballet style, party shoes that should have been at home in the shoe box! 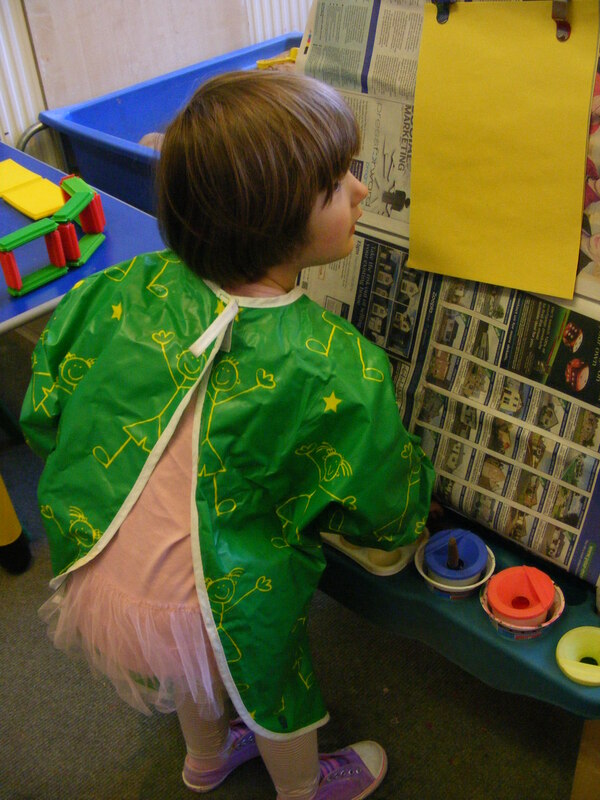 I was in the playgroup room getting Bart’s coat on her when AJ went by heading to the toilet. “Hi Mum” she called and waved at me. AJ glanced down and realised what she was wearing. She looked back at me with dawning horror. My girl had been caught red handed pink footed. Yep, she was busted, again! She now has to stew for the rest of the afternoon, wondering what is going to happen when she gets home. 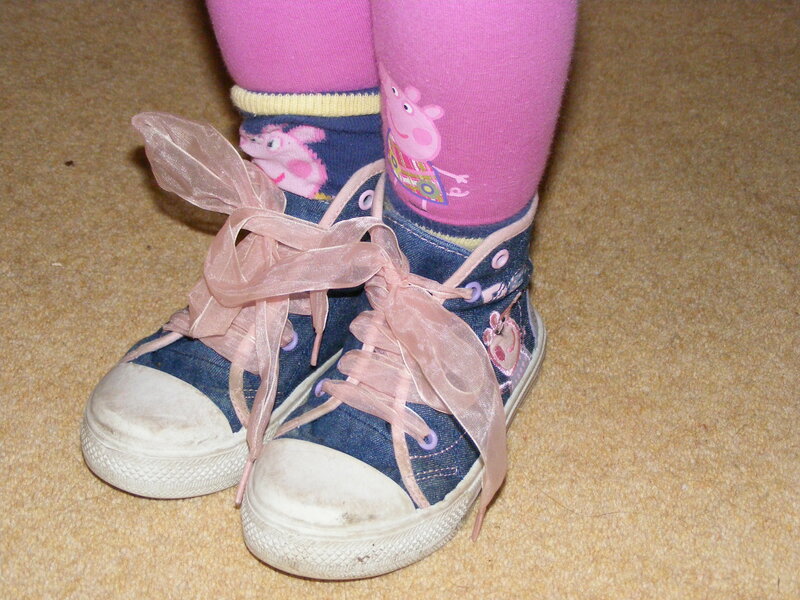 Mean while, I got in the car with Bart, phoned Jay and the pair of us had a good chuckle over her sneaking party shoes to school. It is a huge day for Bart today. 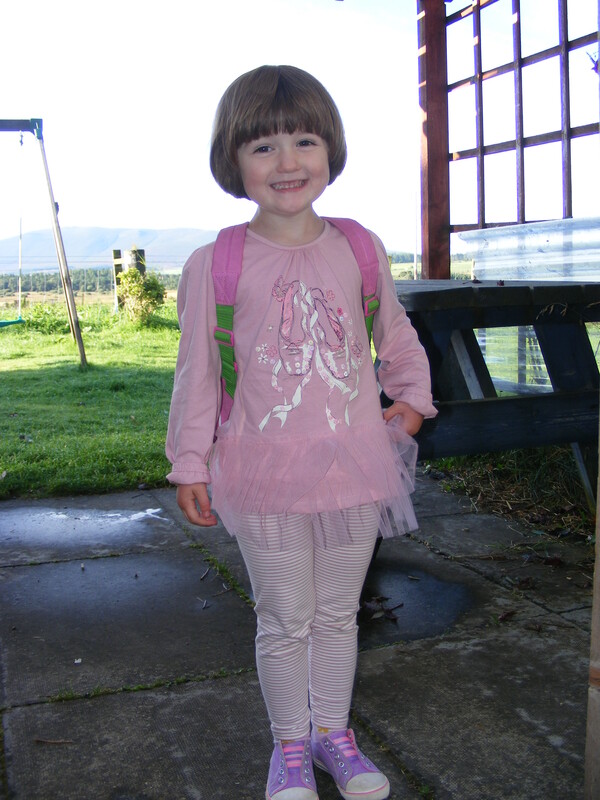 She and some of her playgroup friends are going to spend an hour in big school. 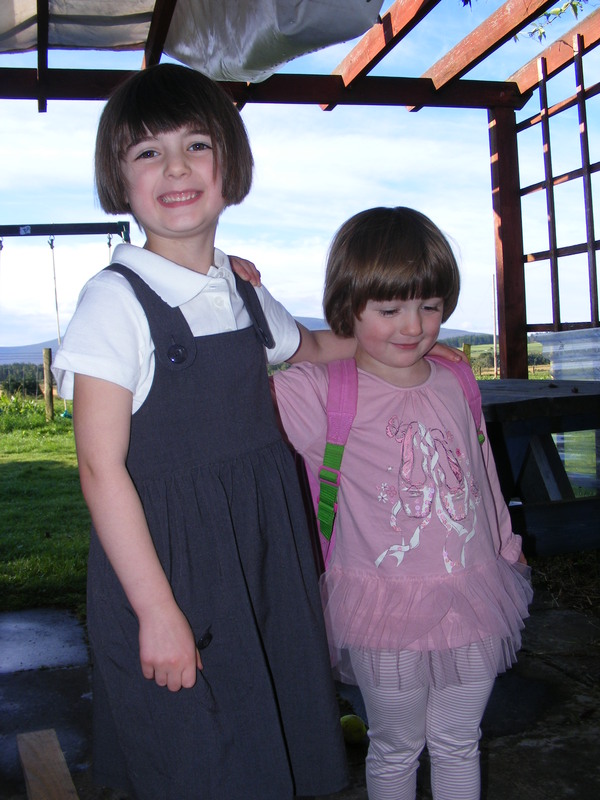 They will be starting primary one after the summer holidays and so this term they get a little introduction into what school is like. She will be going into her new class for an hour every other Friday. To say she is excited is putting it mildly. I just hope the teacher is ready for my little chatterbox! 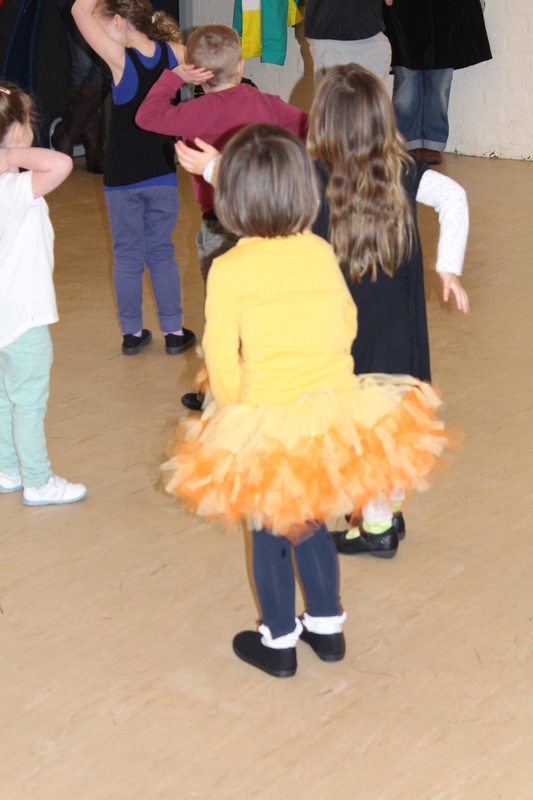 For the last few weeks AJ’s class and Bart’s playgroup have been doing dance sessions at the school. Today the Mum’s, Dad’s and Grandparent’s were invited along to watch the result of all their hard work. Well done girls, we are all very proud of you. 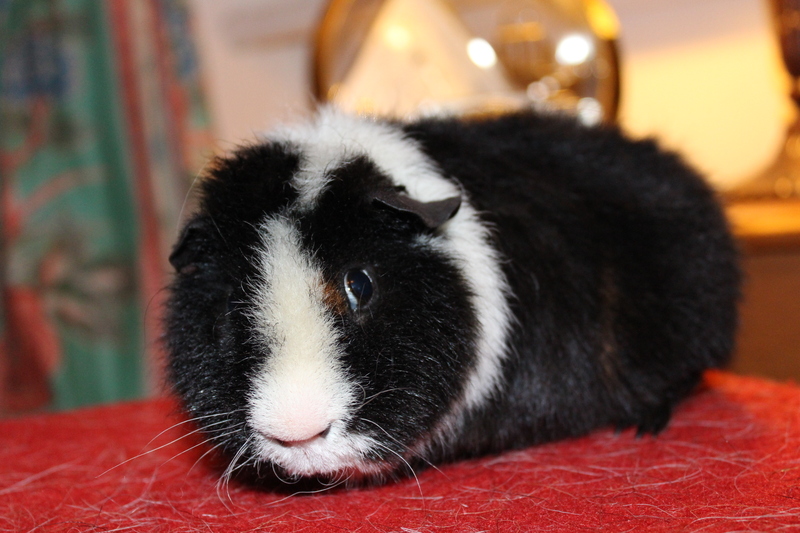 Today I went with Bart to her playgroup to talk to the boys and girls about guinea pigs. I think the session went really well. The pigs behaved themselves (mostly) and so did the kids (mostly). The children got to stroke a Teddy pig and feel his harsh springy coat and then a Swiss pig with his long hair. 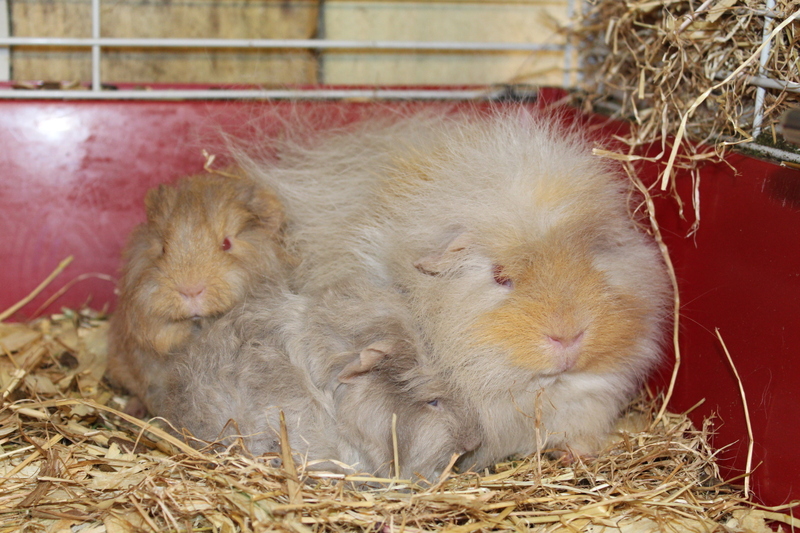 They saw some four-week old babies with their mum. 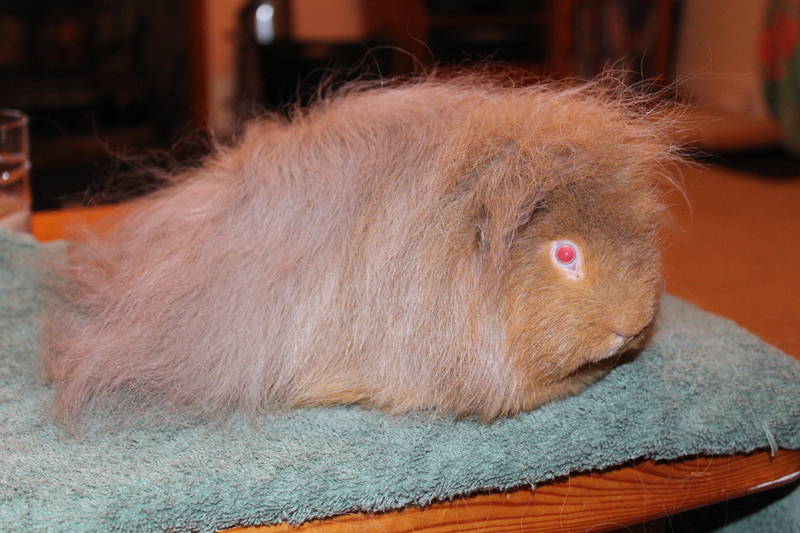 Helga (below) even let them brush her hair. Brave girl. Rhu, my three-month Swiss sow, was so good at sitting on everyone’s lap for pictures that even some of the children who were hesitant to begin with let her. There was much laughter as some of the pigs scrambled from section to section in their carry boxes. 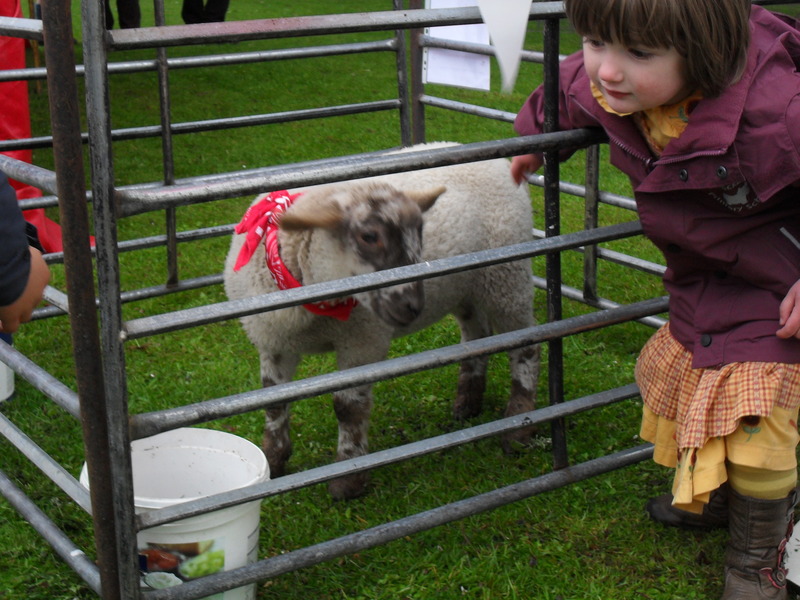 It was great to see the little faces so enchanted with the wee animals. We live in a very rural area where you just have to look out the window to see sheep, cows and horses, there are even some highland cows, alpacas and pigmy goats on our way to school. But I still think it is important for children to interact and touch animals. So I love taking along our family pets for them to see. On Wednesday we will load up the car again as AJ is taking her pigs to talk about them with her class. Like many little girls and some little boys in the UK, Bart is Peppa Pig crazy. 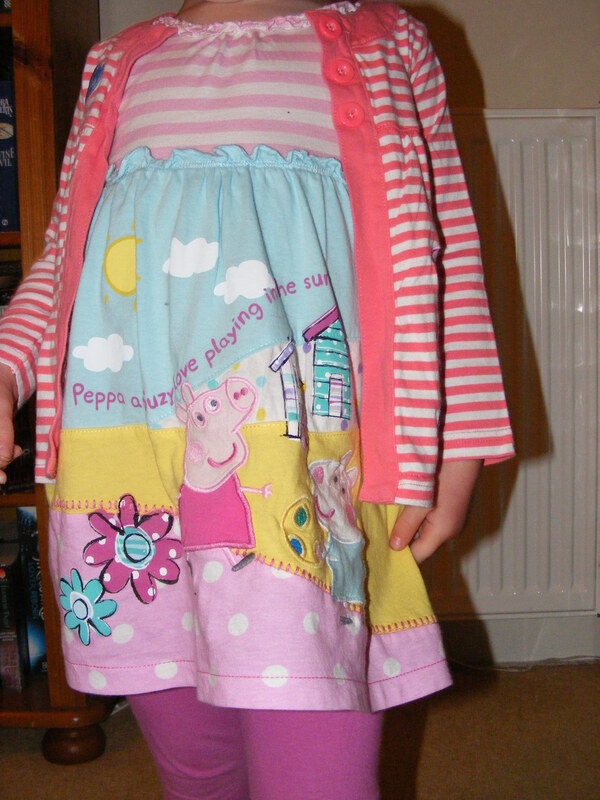 So this morning when picking out her playgroup outfit she chose her cute little Peppa Pig tunic to wear. 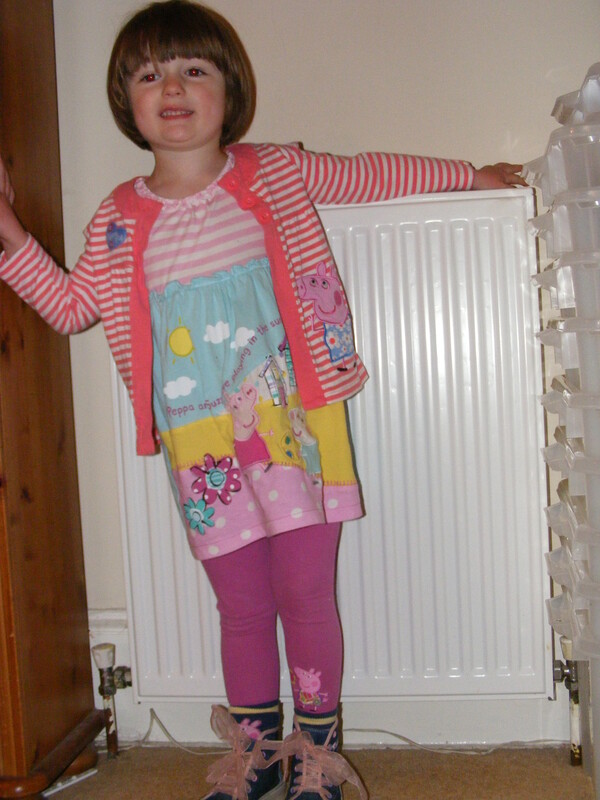 She got a pair of spotted pants and when she went to the sock draw she came back gleefully waving a pair of Peppa socks. Knowing what underwear was in her draw, I dived in and resurfaced with a pair of Peppa Pig pants to exchange for the spotty ones. Oh, a challenge! 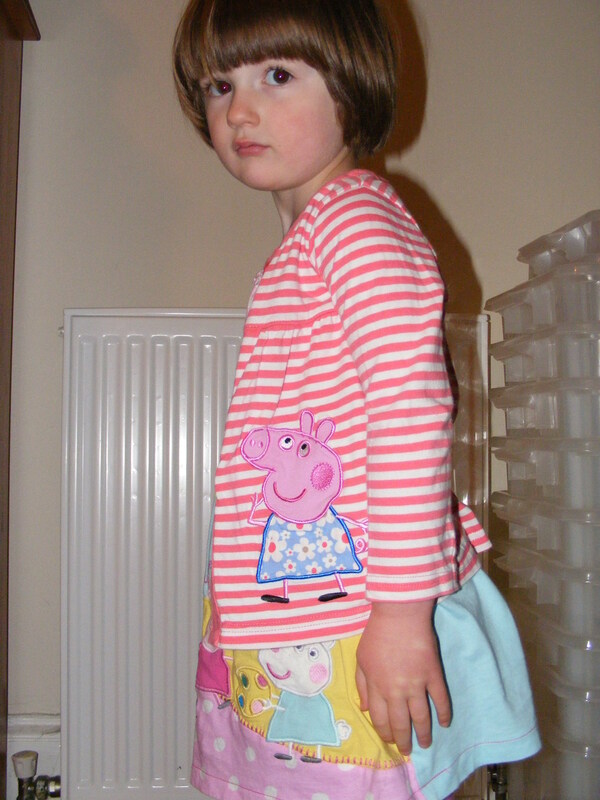 With trousers flying over my shoulders left and right, I finally found a pair of Peppa leggings and then a striped Peppa cardigan. She even had a pair of base-ball boots. 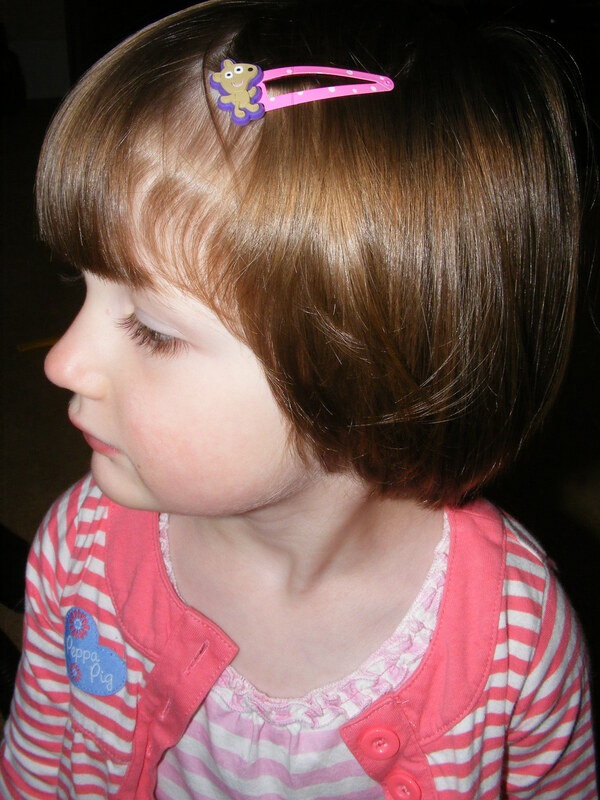 Then to top it off, I found a Teddy (Peppa’s favorite toy) hairslide. Challenge complete! Bart was kited out head to toe in Peppa Pig. I imagine the Pig family are laughing all the way to the piggie bank! Summer holidays are o ver. The seven long weeks I was not so secretly dreading, actually passed rather quickly. This week the girls returned to school. 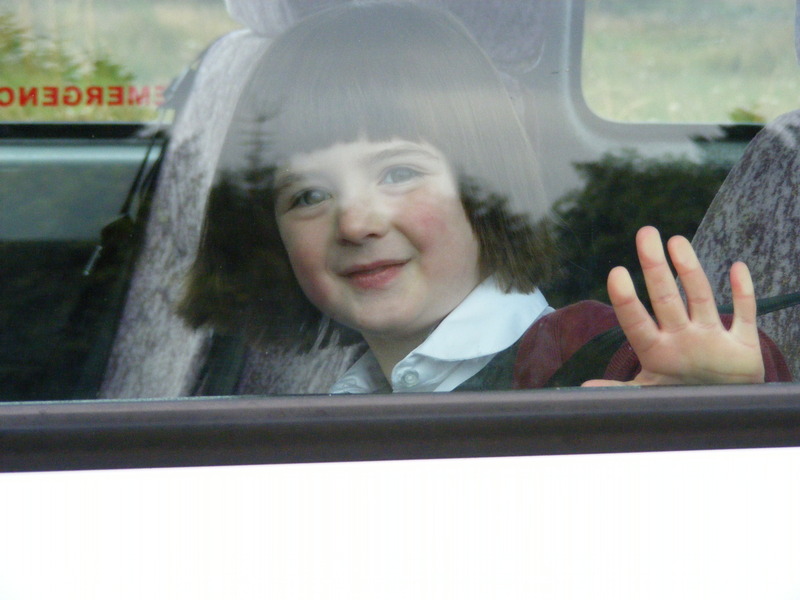 AJ headed off on Tuesday morning, bound for the grown up world of Primary Two. 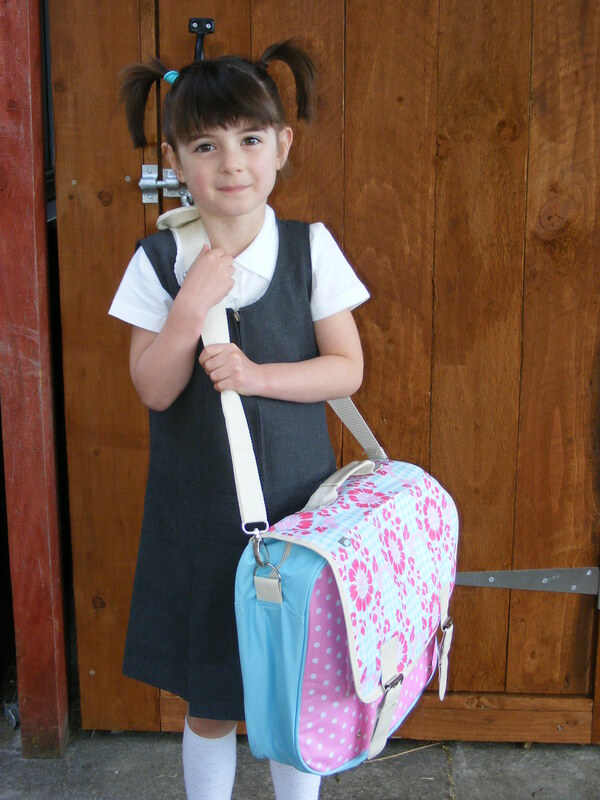 She had new uniform, new shoes, new school bag. There was a brief mad hunt for the school pencil-case I had confiscated at the beginning of the holidays (for drawing on walls). Lunch was made and put into her new sandwich bag and play snack tucked into the front pocket of her satchel. Finally we were ready.The three of us jumped into the car and headed to the village to get the school bus. 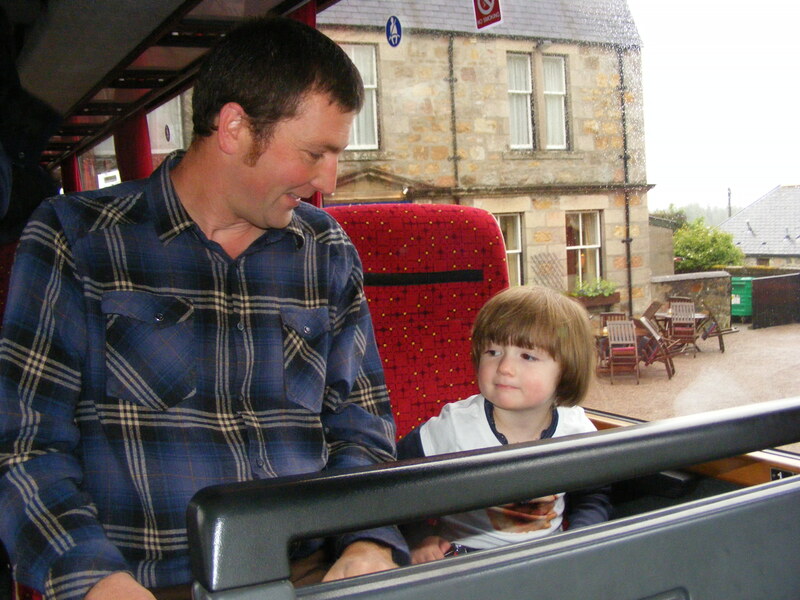 AJ was excited to see her friends, but especially to see her favourite bus driver Isabel, who we thought was retiring at the end of last year. With a big grin and a wave, off she went. 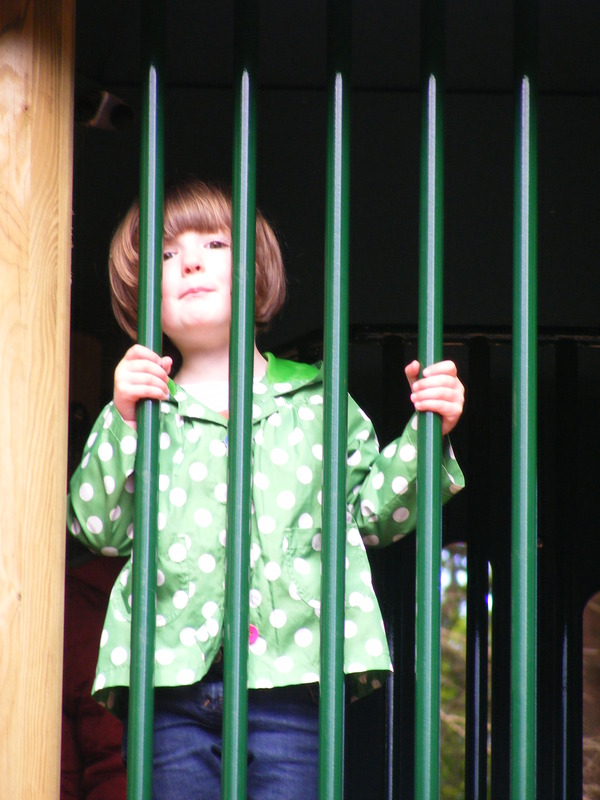 Then Thursday Bart returned to do her final year of playgroup. 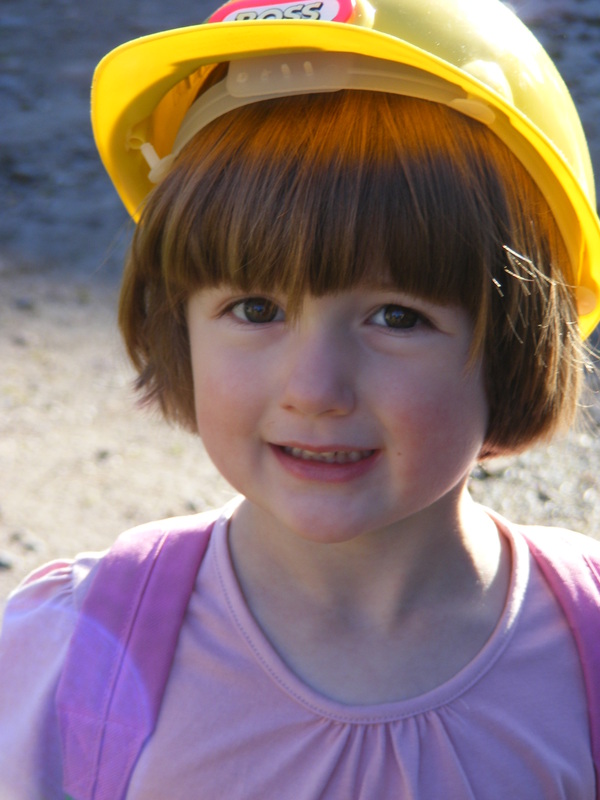 She wore a cute pink outfit we had chosen is a shop yesterday and acce ssorized with a yellow builders hard hat! 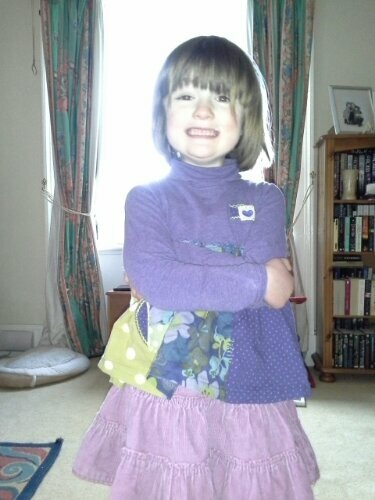 We packed her Ben and Holly bag with gym shoes and spare pants and were ready to go. Bart was pleased to see all her friends and quickly settled down to the important business of painting, jigsaws and games. 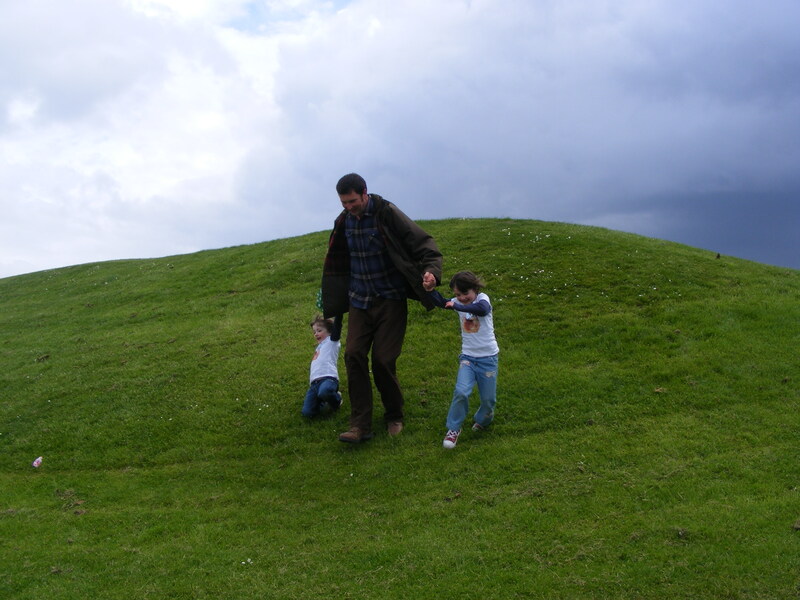 As for me, I came home and had a leisurely cup of coffee, hung the laundry on the line, cut some fresh grass for the guinea pigs, cleaned out two hutches and still had time for a second cuppa. 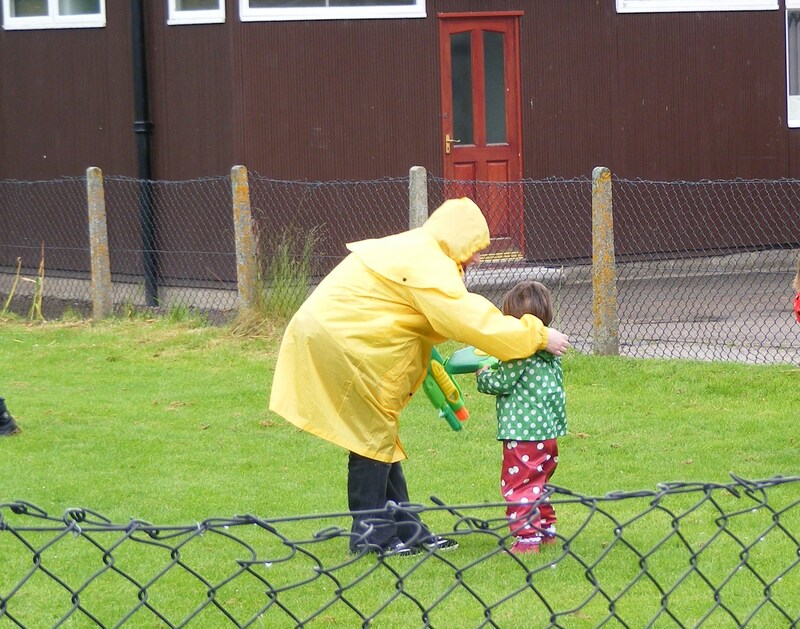 Today was Bart’s last day of term at playgroup and like previous years the playgroup leaders, all the children and their parents headed out to the school field for a water fight. 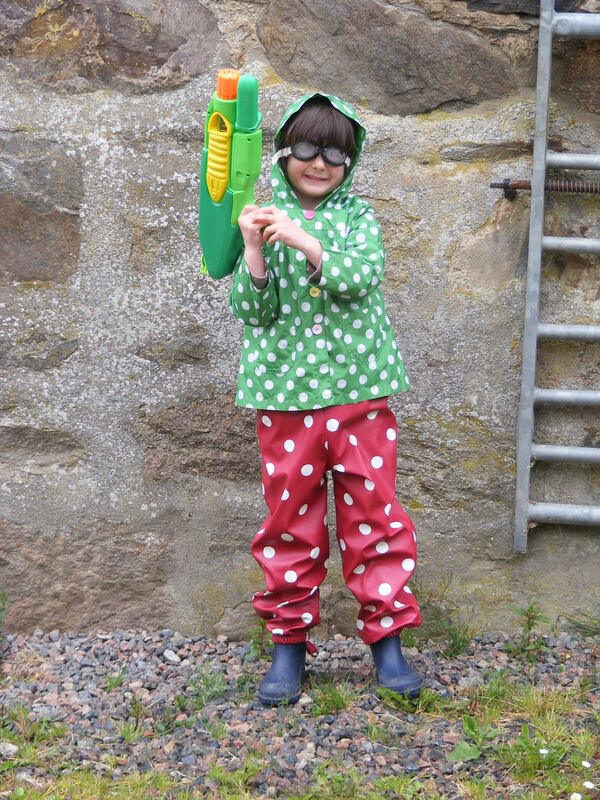 Bart went prepared with her shower proof jacket and water proof dungarees… unfortunately I forgot her wellie boots. She was super excited and had been talking about ‘shooting gun day’ ever since we had bought her and AJ a gun each a few weeks ago. When I rolled up at the school at 11.30 everyone was outside in the drizzling rain and had started. So I donned my bright yellow waterproof coat, armed myself with a water gun and camera, then headed out. In my head I heard a wild west theme and imagined tumble weed rolling past. 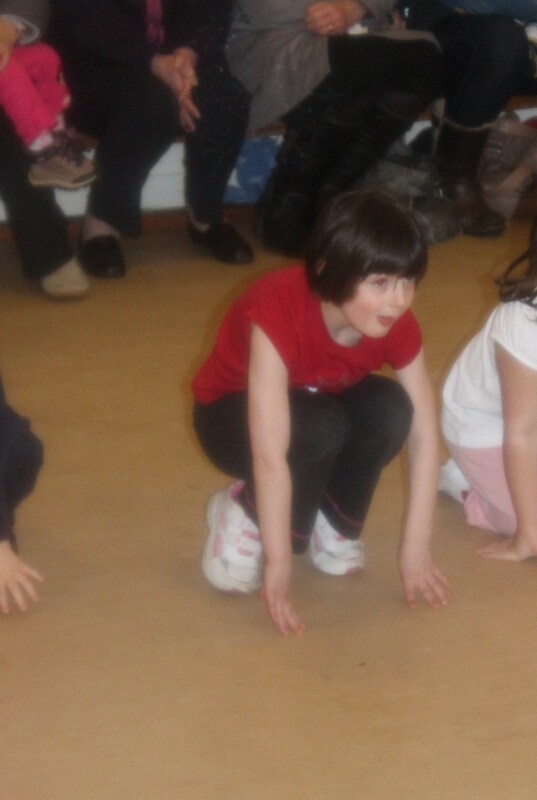 I actually looked more like a stunted Big Bird squelching through puddles. I stopped at the side of the field to snap some pictures, not knowing one of the Dad’s had snuck behind me until I got an earful of water. Stuff that for a game of soldiers… the fight was on. Armed with my pump-action water gun I launched into the fray shooting whoever got in my way be they three-foot or six-foot tall. Thankfully my worst fear wasn’t realised and the colour in my home hair dye did not run and leave me looking like a Wes Craven slasher victim. Although I closely resembles a drowned rat by the time my fighting was over. Bart and I discuss warfare tactics. So that’s it, another year over. 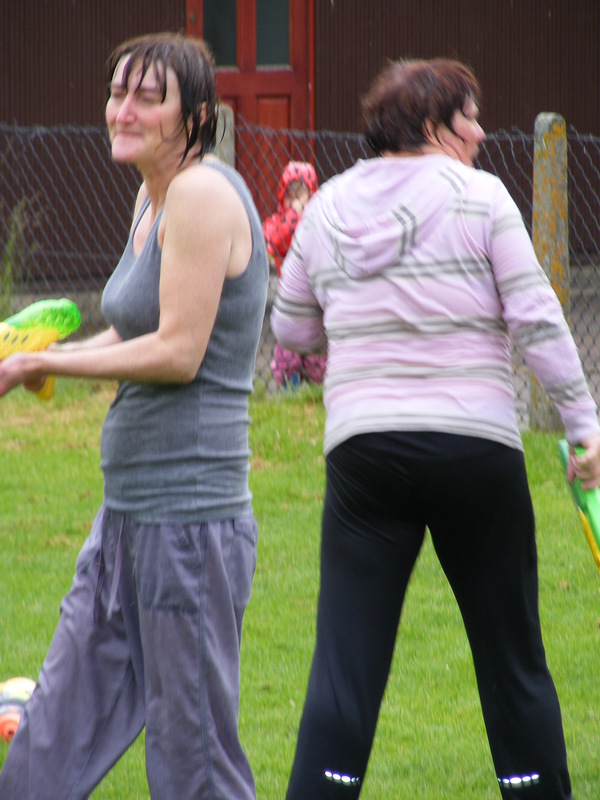 I have one more water fight to attend this time next year and my playgroup days will be done. 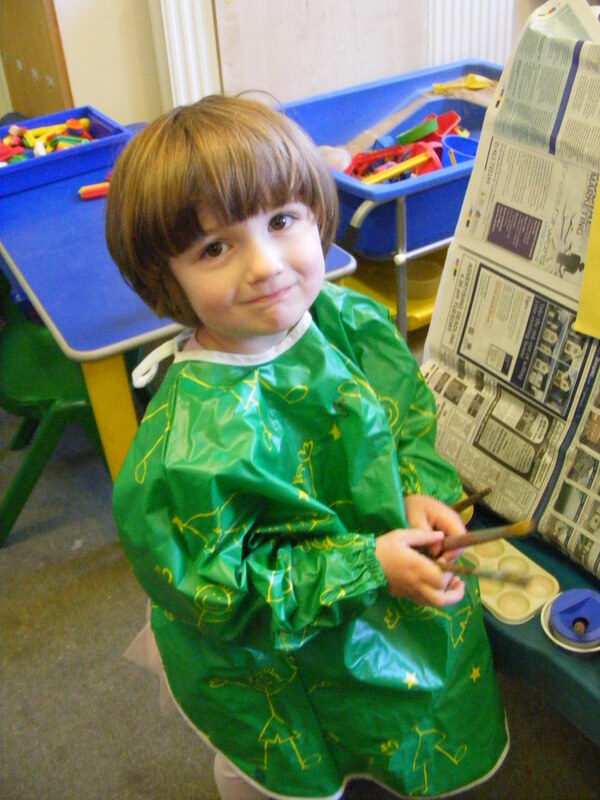 Even the thought of it makes me sad, it is such a loving and happy place for our children to start their school life. Thank you Nicola and Viv for all your hard work. We really do appreciate you. Our wonderful (and wet) play group leaders. Put your hand up… NOW! Why It’s Been Quiet On The Northern Front. 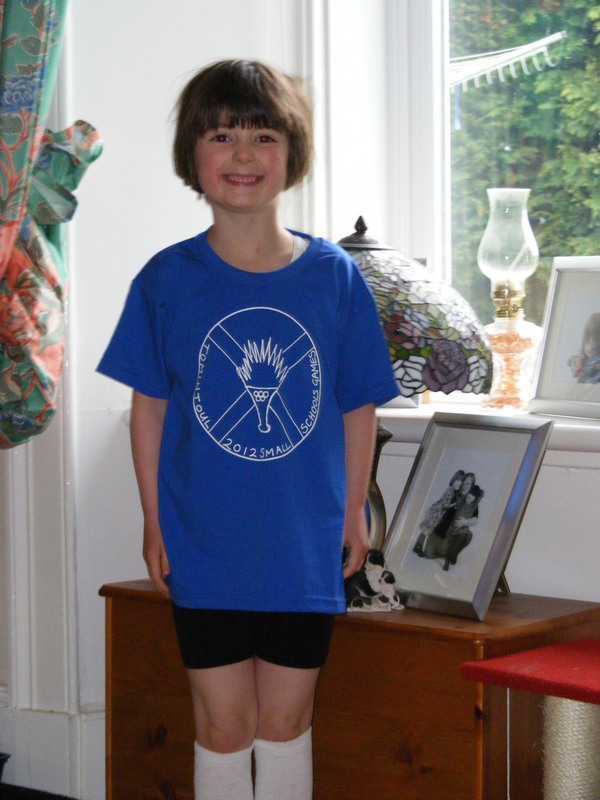 The Olympic Torch has passed this way and AJ’s school entered the Small Schools Olympics. 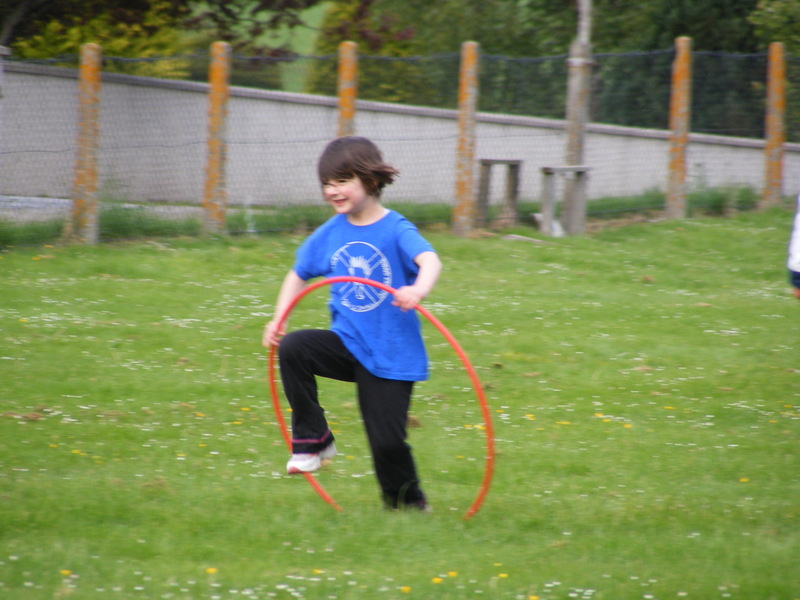 Seven little village schools joined in with all the children having a go at a new sport in the morning and taking part in events in the afternoon. Jay took the day off work and we took Bart to watch the games and the torch pass by. 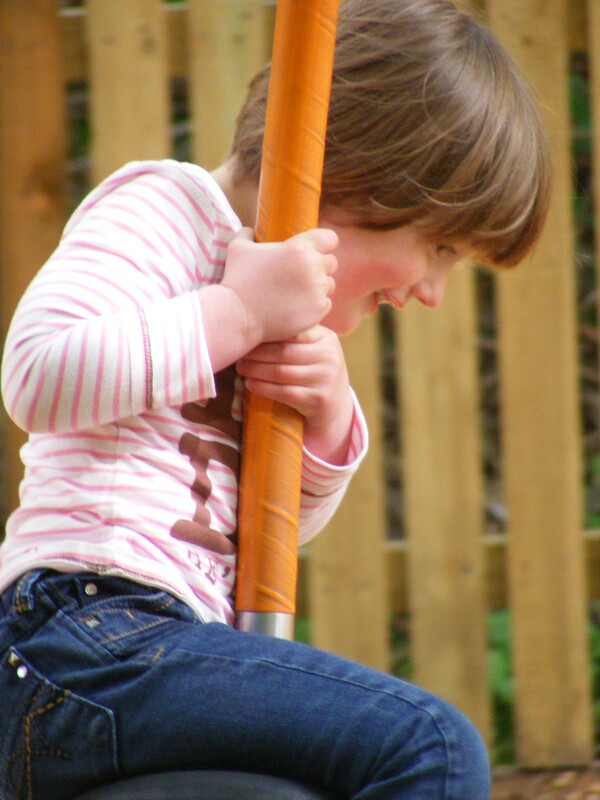 Bart’s playgroup held a Jubilee tea party for the Mums and Dads who were able to attend. We had sandwiches and cakes as well as tea in pretty floral china cups. 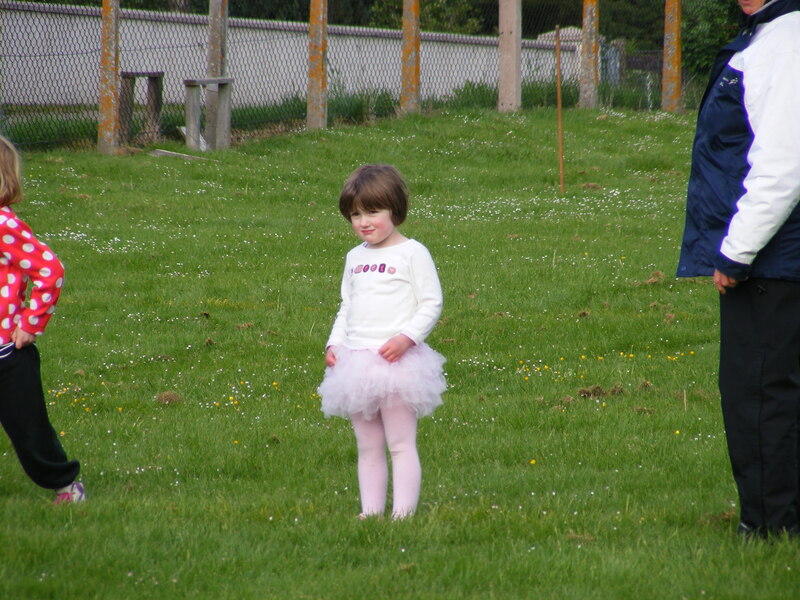 We then had AJ’s sports day the following evening. 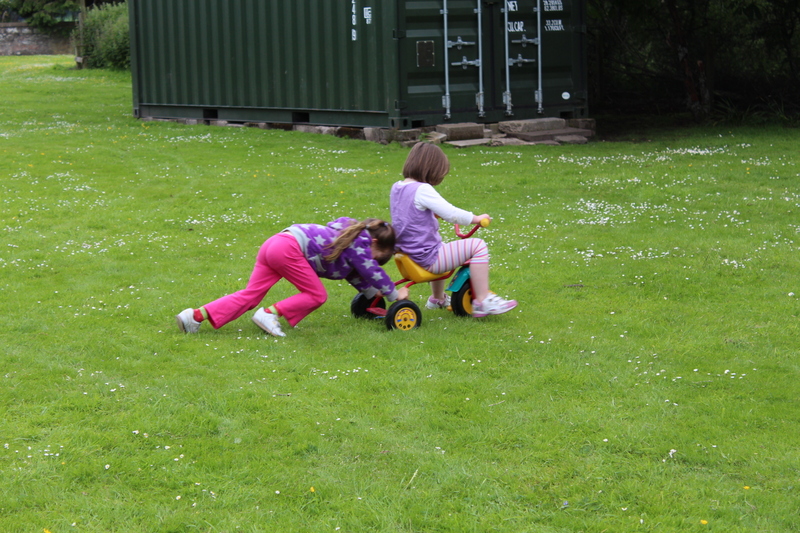 Alternating between bouts of rain and swarms of midges the children raced for all they were worth. 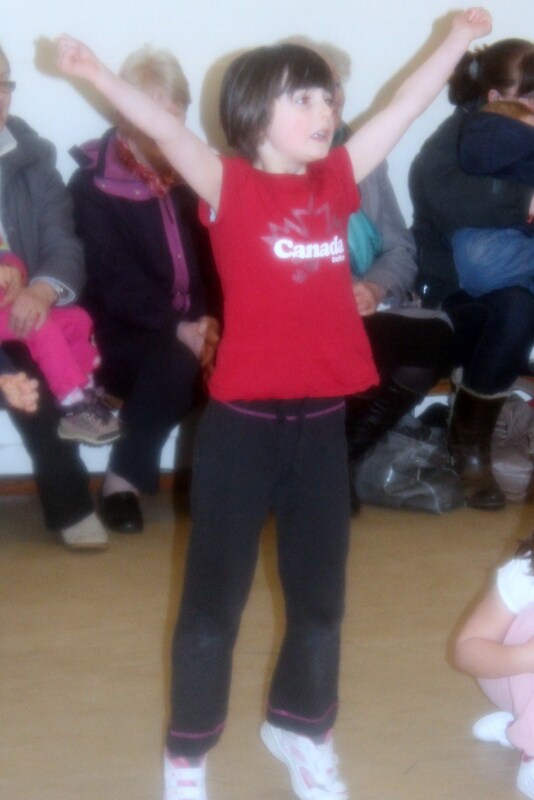 AJ received four third places and a couple of well done’s for her efforts. 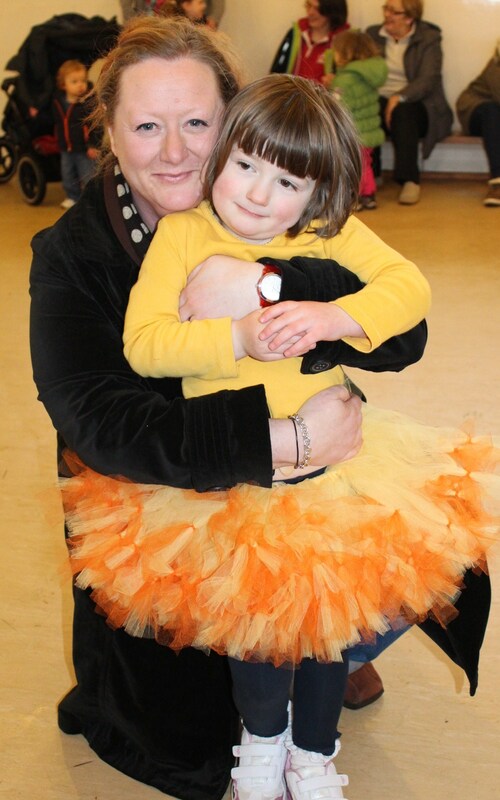 Even Bart got in on the action taking part in the wee ones race while wearing her super aero-dynamic racing outfit tutu! While this was all happening I decided it was time to start formal introductions between Nibbles and Tallulah. 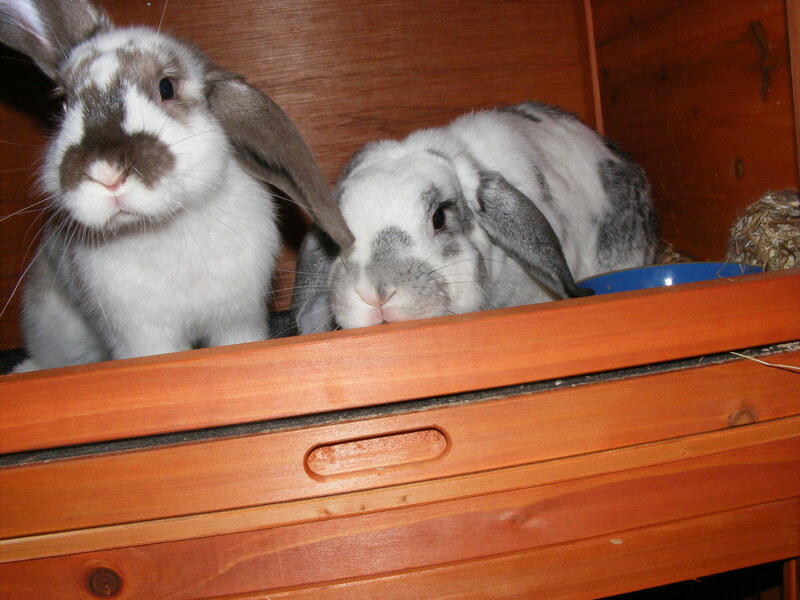 After a brief fur flying fight on the first day, the two bunnies soon got used to jumping into each others hutches until we were able to settle them in the same one. They look so cute cuddled up together. The village fete took place and although I did not have to help on the stalls, I spent the day before furiously baking cupcakes and banana loaves. (I had to bake extra knowing Jay would not be able to resist eating one of the home-baked goods!) 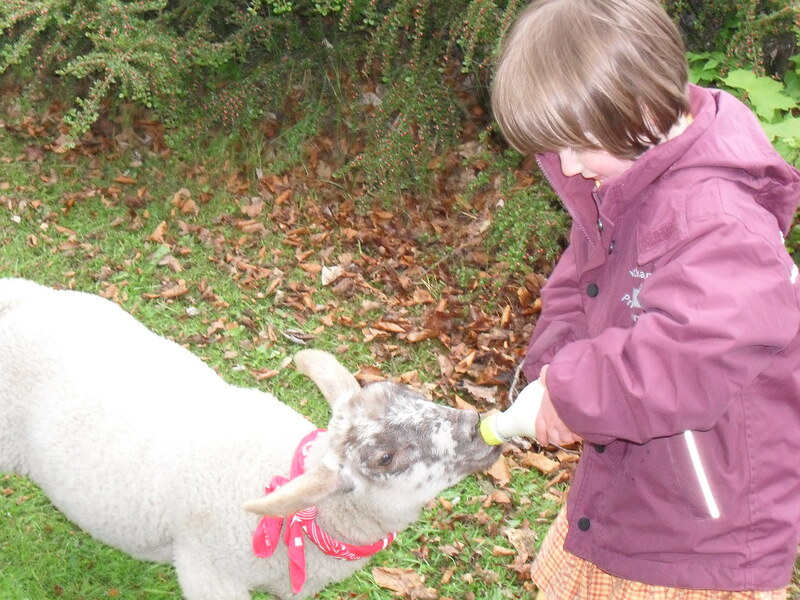 Bart had a fun time making friends with a cute lamb called Thimble, which she got to help feed. I attended the playgroup AGM where the outgoing committee members all resigned their posts. Although internally I was chanting “Don’t volunteer, don’t volunteer” when nobody else spoke up I took on the role as secretary for the next twelve months. 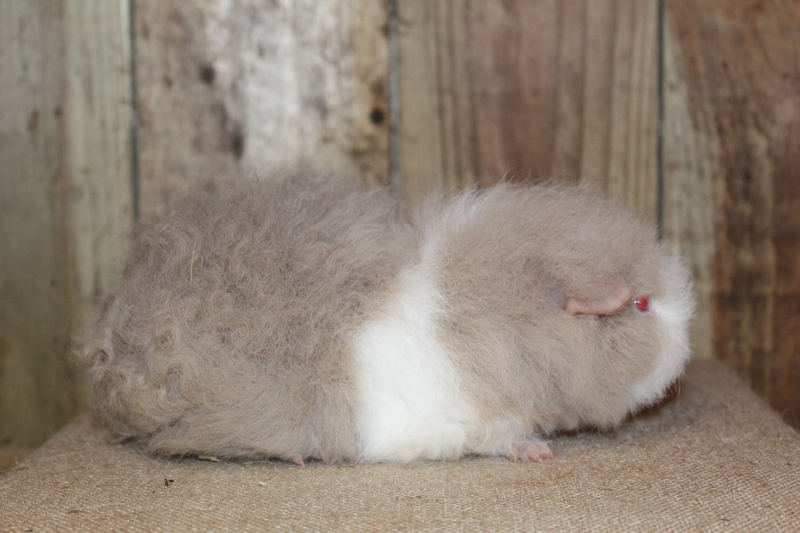 Meanwhile our little three-legged hamster, Daisy is doing really well. She is running around her cage as fast as she ever did. 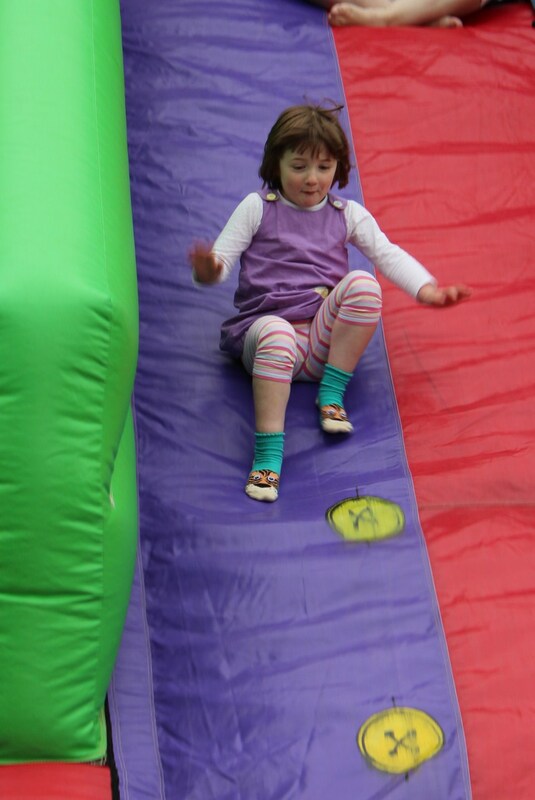 Although she does lose her balance sometimes and fall, she is such a trooper getting back up and racing again. AJ had another party invite. This one said bring a water gun and water proofs. 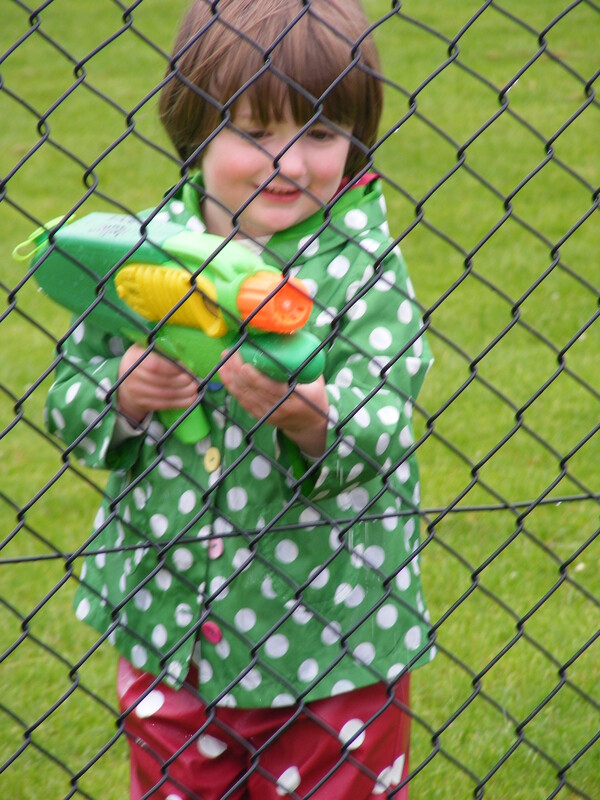 A couple of hours with her school friends, running around a field in the rain shooting each other with water all to claim a flag. Followed by face painting, hotdogs and party food. My girl was in heaven. I decided I was bored with my hair and it was time for something new. So on a trip to Asda, I stopped the trolley in the isle for hair dye. With input from Jay and my two mini stylists we decided on a deep wine red colour. Unfortunately my first home attempt did not come out as well as I hoped, so I ended up buying a second box and doing it again. 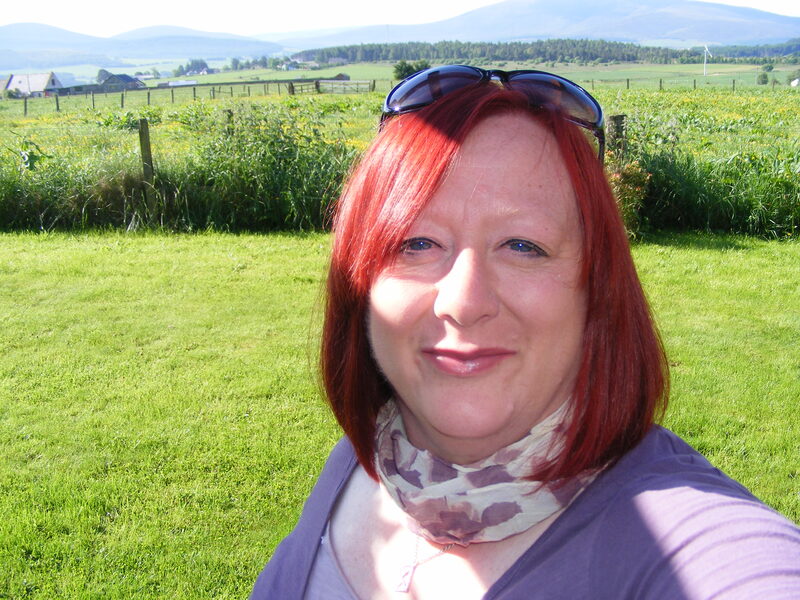 It is still a bit of a shock when I catch myself in the mirror, but I really like the change. Bart had been coughing during the night, it got so bad one night that she, along with Jay and I did not get much sleep, so I took her to the doctors who diagnosed acid reflux. She is now taking medicine before bedtime which really seems to be helping. Last Saturday was the village summer outing. The four of us arrived in the square at 10am to catch one of two big white buses heading to the seaside. The rain was coming down but despite that quite a few soggy villagers clambered on the buses clutching deck chairs, tents and for one optimistic family, buckets and spades. When we arrived at the beach the rain had stopped, although it was still overcast. I think everyone enjoyed themselves despite the lack of sunshine, some crazy brave kids donned their swim suits and headed into the North Sea. It made my teeth chatter just looking at them. 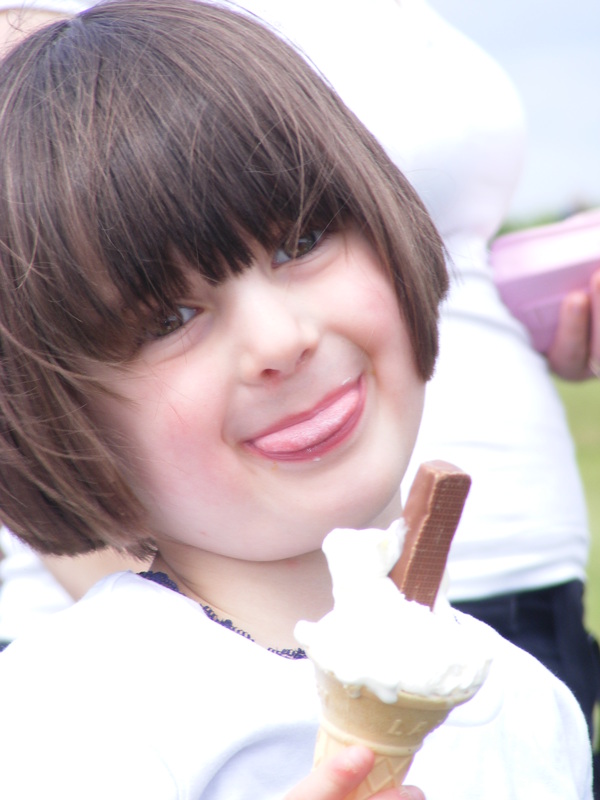 A picnic lunch was provided followed by ice cream later in the afternoon. We did a hasty pack up and back onto the buses when the heavens opened at around four o’clock, then headed back to the village hall for an indoor barbecue. On Sunday Jay and I laid new lino in the ‘rabbit room’ during which he decided to try and teach the girls break dancing… yes… try… I will leave it at that. Monday was AJ’s summer school trip. All the teachers and pupils headed off to the cinema to watch Top Cat followed by lunch and playing in a park. Today was Bart’s playgroup fun day. 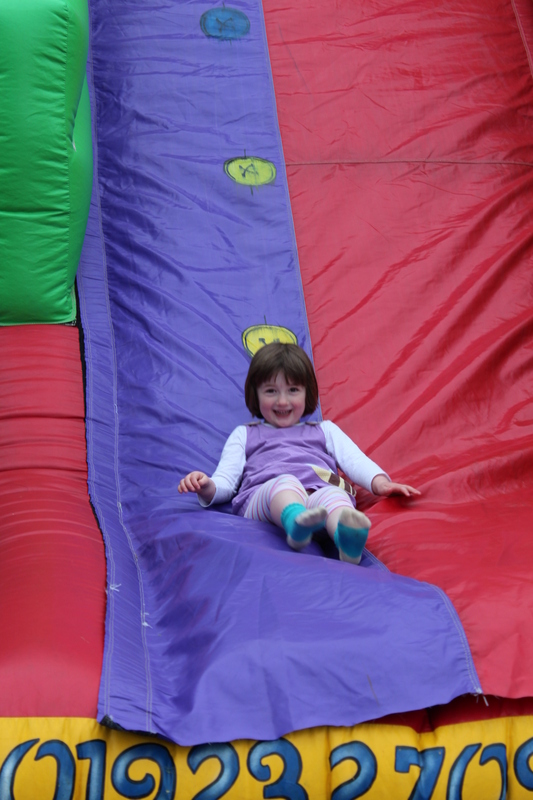 A bouncy castle/slide was hired much to the excitement of all the kids. There was also snacks and lunch boxes. The children who are moving up to primary one next year all wore little black graduation hats they had made themselves and each child got presented with a book, Jubilee coin and a toy. 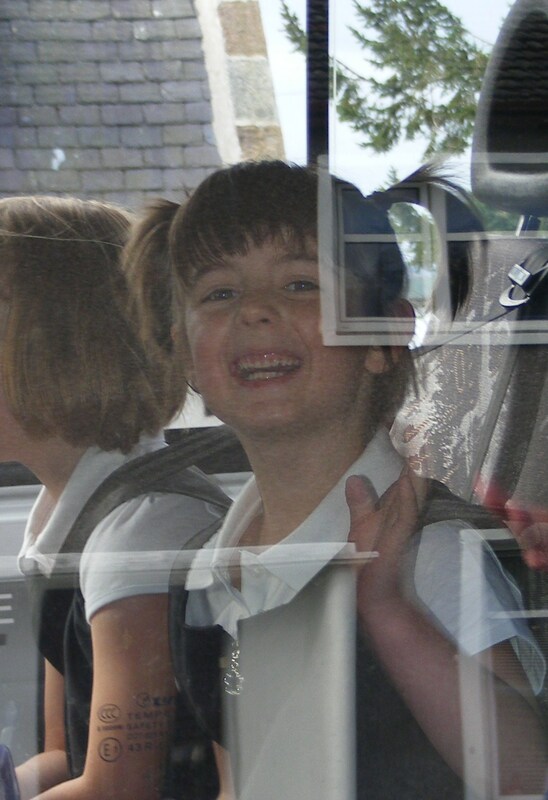 AJ’s school has a service in the church at ten o’clock tomorrow morning, where the children heading to high school get to talk about their time at the primary school and we get to see photo’s of them over the last seven years. I have been warned to take tissues and seeing as I can cry at most things, I think this is good advice. Then on Thursday it is AJ’s last day in Primary 1. I cannot believe how fast this year has gone. 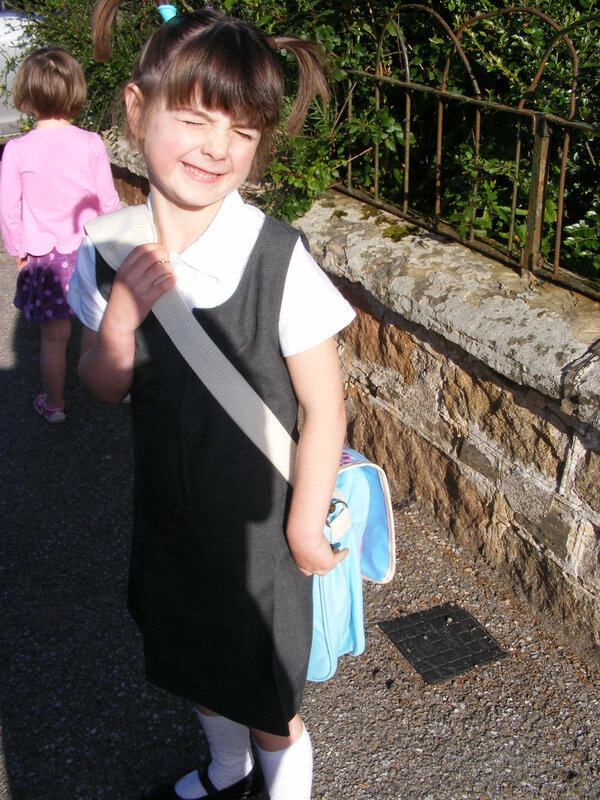 My little girl who was so excited to go on the bus that first day will not be the youngest in the school anymore. 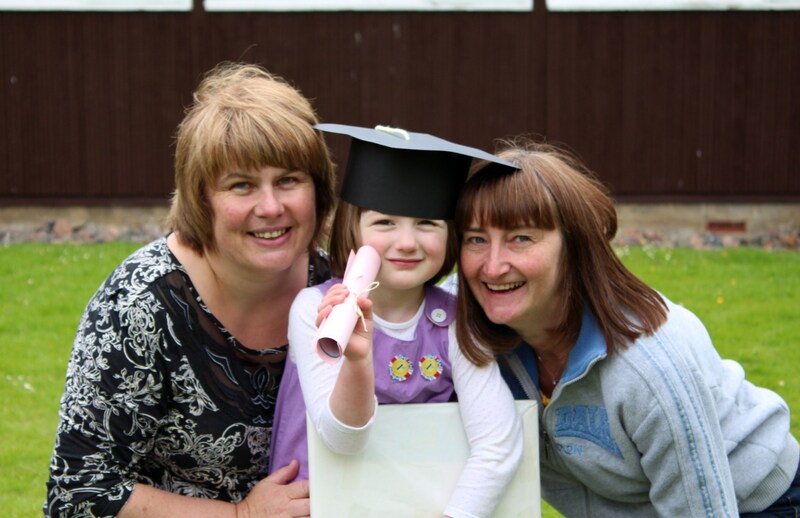 A new crop of playgroup ‘graduates’ will be starting in August. Jay and I are so proud of what she has achieved this year. She came home that first day clutching her homework, learning to read and write a single letter at a time and now she reads books. She knows her numbers and can add them together. 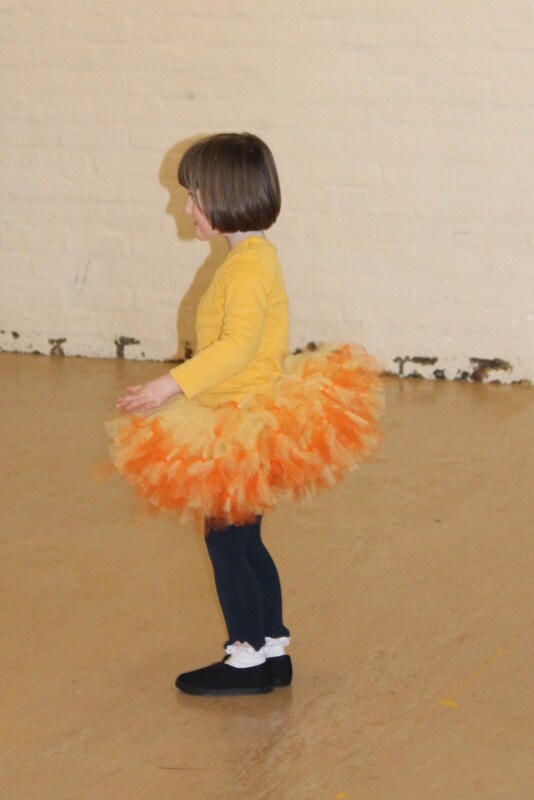 Show and tell is the highlight of her week and she loves art class and dancing. She has a wonderful teacher who she will stay with for the next three years and staff around her who know her for the little girl she is and not just another face in the crowd. 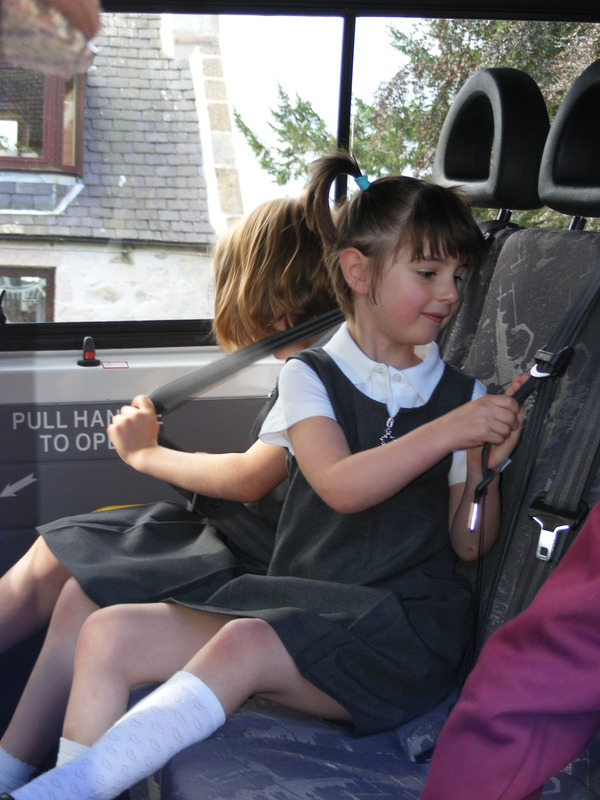 AJ on the bus for her first day of school last year. So as you can see, as we speed towards the end of term, it has been a busy time here and to be honest we are all worn out. Next week both Jay and I have the week off work and we plan to spend some time with the girls, going for some trips out, but generally taking it easy. I for one can not wait.